In the past, female writers such as Charlotte Bronte had to adopt male pen names in order to get their books published. But the tables were turned for former war hero Bill Spence after he wrote a series of romance novels. 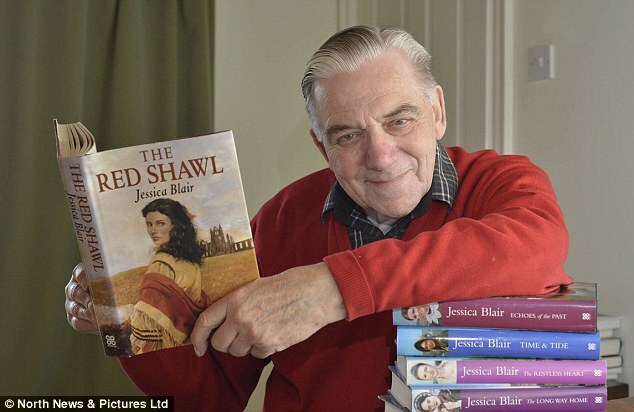 The grandfather from Ampleforth, North Yorkshire, was told his books would need to be printed under a feminine moniker if he wanted them to sell – and so his pseudonym Jessica Blair was born. Bill, 89, has so far written 22 romance novels under the female pen name since his first was published in 1993, with his latest, Silence of the Snow, due out this week. And far from feeling his masculinity had been questioned, Bill said he was delighted when a publisher suggested his books carry the name of a woman. Women staff at a branch of bakers Greggs have stripped off for charity, covering their modesty with buns and biscuits. They bared nearly all for a charity calendar, now on sale at every one of the 1,650 Greggs shops across the UK. Priced at £5 it has reportedly been flying off the shelves and is on course to raise more than £100,000 for the BBC Children in Need appeal. The mouth-watering calendar was the idea of Kelly Gilmour, 32, an assistant ­manageress at the shop in Gateshead, Tyneside, where all the women work. Kelly, who appears as Miss June with a pile of doughnuts and a can of cream, said: “Customers may look at their Belgian buns in a different way now. Here comes Kisstixx, a new product advertised as “the best thing to happen to kissing since the French got their lips on it.” Made in America by two college buddies from Utah, Kisstixx is a set of two compatible lip balms that combine to create a chemical flavor reaction. Kisstixx has been rapidly gaining popularity since the company’s humble beginnings in a college dorm in Utah and has expanded to Osaka’s specialty cosmetics company, “Make Up,” as of September 15. The best thing about Kisstixx is that you get two tubes of lip balm in one pack. Your partner wears one flavor and you wear the other complementary flavor. The lip balm is delicious on its own, but when the two flavors combine, they heat up and create a tingling sensation. “It’s all the about making your next kiss into an EXPERIENCE! Mix and match to your hearts content” boasts the Kisstixx Facebook page. The hair dryer is an essential tool for any woman who wants beautifully styled hair. The Colt Peacemaker is an American single action revolver and iconic pistol of the Wild West. What do they have in common? Not much. But put together, they make the most badass blowdryer (or poorly-designed firearm) this side of the Mississippi. The hair dryer is called the .357 Magnum Dryer (though it’s molded after the Peacemaker) and is a vintage novelty item made by Jerdon circa 1981. According to Dude I Want That, it has a faux-pearl handle and chrome-colored plastic barrel. The perfect position for a man’s junk to rest in his underwear, pants, etc. For men worldwide, to function normally we have to have our gear oriented in the correct position. If through moving or sitting we fall out of chinpoji, then our minds become clouded with neuroses. According to a survey by Japanese underwear maker Wacoal, 75% of men “are anxious about the positioning of their ‘front parts.’” Not just the discomfort going on inside the pants; many men feel that their packages can be seen by people on the outside too when they’re out of place. This causes us to perform emergency public adjustments, which makes any woman within eyeshot go “ugghhh.” In the end no one wins. Yahoo Japan’s R25 explored this issue deeper, seeking to discover if all men’s chinpoji are the same and, if so, ask a medical professional why. Here’s what they found. 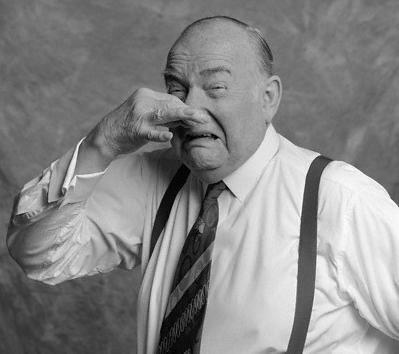 In a survey they asked 300 men aged 25 to 39 what position their chinpoji is. Here are the preferred positions. While “up” and “down” seems rather uncomfortable, the mind reels at what that 0.7% does. Straight out? Coiled? Over the shoulder? Anyways, the results of the survey shows that male genitalia are just like snowflakes. There’s a lot of variety. But there does seem to be a lot of guys pointing to the left. Is there a reason for that? R25 interviewed a medical professional who explained that there’s no medically determined cause, but he did have his own theory. Although the doctor’s logic seems reasonable, he is the first to admit there are many other factors that come into play including size and shape as well as the style of clothing. So it seems that guys vary widely on their chinpoji and the location is possibly related to going on a date with Palmela Handerson, but what can be done to prevent guys from falling out of their chinpoji?